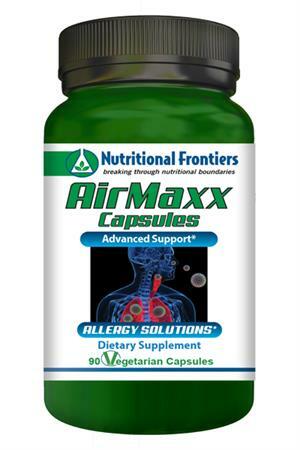 AirMaxx was designed to support healthy respiratory function and reduce allergic response. * The ingredients in this supplement were selected with the goal of maintaining histamine levels within normal ranges. * People take AirMaxx to help with itchy skin and eyes, congested and runny nose, splotchy, red skin, and discomfort associated with skin irritation and respiratory dysfunction. Allergies occur when the body mounts an immune reaction to a perceived threat or ‘invader.’ The body’s defense involves bio-chemicals that produce characteristic allergic symptoms. Allergic reactions can occur in the nose, mouth, skin, throat, stomach, and/or intestines. Symptoms can include one or more of the following: itchiness, redness, swelling, discharge from eyes or nose, wheezing, hives, vomiting, stomach cramps, diarrhea, indigestion, difficulty swallowing, cough, shortness of breath, dizziness, and more. Vitamin C is a powerful immune booster and antioxidant. It helps form red blood cells and provides antioxidant protection against free radicals. Furthermore, it supports collagen production to benefit skin, teeth and bone health. *Vitamin C also regulates histamine production and metabolism. In studies, low vitamin C was associated with higher histamine production and administration of vitamin C reduced blood histamine levels. Factors such as coffee, tea, smoking, illness, strenuous exercise, physical and mental stress, and certain prescription medications may deplete Vitamin C levels in the body. Benegut® Perilla Leaf Extract can reduce inflammation and manage histamine levels. Perilla leaves are renown in Chinese and Japanese herbal medical traditions for addressing respiratory problems and allergies. Modern research confirms that perilla leaf alleviates both allergic and inflammatory responses in the airways. This herbal extract is utilized to reduce discomfort associated with histamine release including skin irritation, redness, sneezing, stuffy nose, overproduction of phlegm, skin and eye irritation, and runny nose. * Animal & in vitro studies show that rosmarinic acid in perilla extract reduced allergic inflammatory reaction by decreasing IgE and histamine, which suggests benefits for allergic rhinitis and allergic rhinoconjunctivitis. Another animal study shows benefits of rosmarinic acid derived from perilla in allergic asthma. TRACCS® Zinc Arginate Chelate is a trace mineral found in bones, teeth, skin, skeletal muscle, prostate, testes, liver, white blood cells, and the retina. Zinc serves many functions in the body like supporting immunity, gene expression, protein folding, enzyme function, and wound healing. Numerous research studies have shown that zinc enhances immune response during infection, such as increasing CD4 T cells and T lymphocytes. Additionally zinc may reduce the duration and severity of common cold symptoms. Dimethylglycine (DMG), a derivative of glycine, possesses antioxidant activity. It protects against oxidative stress by enhancing performance of the antioxidant defense system and by improving free radical scavenging capacity. DMG may promote oxygen utilization and boost immune response. Quercetin is a flavonoid demonstrating many biological effects, including anti-allergy activity. It reduces the effects of histamine in the body. Weng and colleagues compared quercetin to the pharmaceutical drug cromolyn (a mast-cell stabilizer). They found that both agents inhibited secretion of histamine, prostaglandins, & leukotrienes. Quercetin was more effective than cromolyn at reducing inflammation. Also, quercetin was better at preventing symptoms, while cromolyn can only be used acutely or it rapidly loses its effect. In another study, quercetin reduced allergic eye symptoms caused by pollen. Bromelain is an enzyme derived from pineapple that is well known to reduce inflammation, relieve swelling and discomfort, modulate the immune system, and more. Elderberry, also called Sambucus nigra, has been used by herbalists for pain, inflammation, coughs, and laryngitis, along with preventing and treating cold and flu symptoms. Both in vitro and animal studies show that elderberry is anti-viral and reduces excessive sinus mucus excretion, making this plant an important ally in promoting sinus and upper respiratory tract health. Citrus bioflavonoids (Capsules Only), lemon bioflavonoids, and vitamin C have been included to support the immune system, capillary and connective tissue health. * Bioflavonoids increase the effectiveness of Vitamin C by 50%. ActiVin® (Capsules Only) grape seed extract uses the patented, environmentally friendly ActiPure® natural water extraction process. This process is able to recover more of the potent OPCs from the grape seed proanthocyanidins. Suggested Use: As a dietary supplement, take 1 capsule daily, or as suggested by your healthcare professional.